President Donald Trump and first lady Melania Trump with their son Barron Trump talk as they walk on the South Lawn of the White House in Washington, Tuesday, Nov. 20, 2018, to board the Marine One. Trump arrived at the club on Tuesday night and by Wednesday morning was at his nearby golf course. As he departed Washington, Trump said he'd be doing "a lot of work" while in Florida, but Mar-A-Lago also serves as the president's refuge from Washington. All presidents have had their favorite retreats: George H.W. Bush's family had a compound in Kennebunkport, Maine; George W. Bush loved his ranch in Crawford, Texas; and Barack Obama savored winter getaways to his home state of Hawaii. But none has drawn the fascination — or raised the ethical issues — of Mar-a-Lago, where Trump spends his time mixing work, business and pleasure in the company of dues-paying members. It's one of the many ways in which Trump has transformed the presidency and managed to hold onto the life he had before taking office. "His visits to Mar-a-Lago are part of the original sins of his presidency, and the fact that he's returning there shows that he has not learned his lesson," said former White House ethics lawyer Norman Eisen. He described the club as "a place where, for sky-high admissions fees, business executives who have strong interests before the government can literally engage in purchasing access to the president. Those fees also seem to be down payments on ambassadorships." Indeed, Trump recently picked Lana Marks, a Palm Beach handbag designer and Mar-a-Lago member, to serve as U.S. ambassador to South Africa. She's the fourth member to be nominated for such a post, according to the watchdog group Citizens for Responsibility and Ethics in Washington, where Eisen serves as board chairman. Former administration officials described the lengths to which aides have gone to try to run interference: scanning daily guest lists, reserving the dinner table next to Trump's to keep as close an eye on him as possible and keeping tabs on the people who approach him to make sure none raises alarms. Trump's presidency has forced the club to adopt new security measures, among other changes. He's hosted Japan's Shinzo Abe and Chinese President Xi Jinping at the club for diplomatic summits, plotted a response to a North Korean missile launch from the club's candlelit outdoor dining terrace and delivered a statement to the nation from one of its ballrooms. Members now clamor for dinner reservations on nights they know Trump will be in town. Membership fees are up. And some groups that used to hold events at the club now steer clear to avoid controversy over patronizing the president's playground. But much has also stayed the same, with Trump returning to his old, pre-presidential role of glad-handing host and "mayor of Mar-a-Lago," schmoozing with members and their guests as he'd done for years before his 2016 election. Trump is expected to have a limited public schedule over his Thanksgiving break. Last year, his only public events took place on Thanksgiving Day, when he held a video conference call with service members from one of the club's ornately decorated rooms and visited a nearby Coast Guard station to hand out lunches. That was before a Thanksgiving dinner that felt more like a homecoming, as Trump joined more than 500 of the club's members and guests in a gilded ballroom for a meal that included traditional turkey, stuffing and mashed potatoes, as well as local favorites like Florida stone crab. "It was very thrilling because when the president and first lady entered, without anybody saying anything, the whole room rose and everyone started applauding," Toni Holt Kramer, a Mar-a-Lago member who founded a boosters' group called Trumpettes U.S.A., recounted last year. "The unity was overwhelming." During last year's Thanksgiving stay, Trump visited both of his nearby golf properties, playing with champions including Tiger Woods, Dustin Johnson, Jack Nicklaus and Nicklaus' pro-golfer son, Gary. 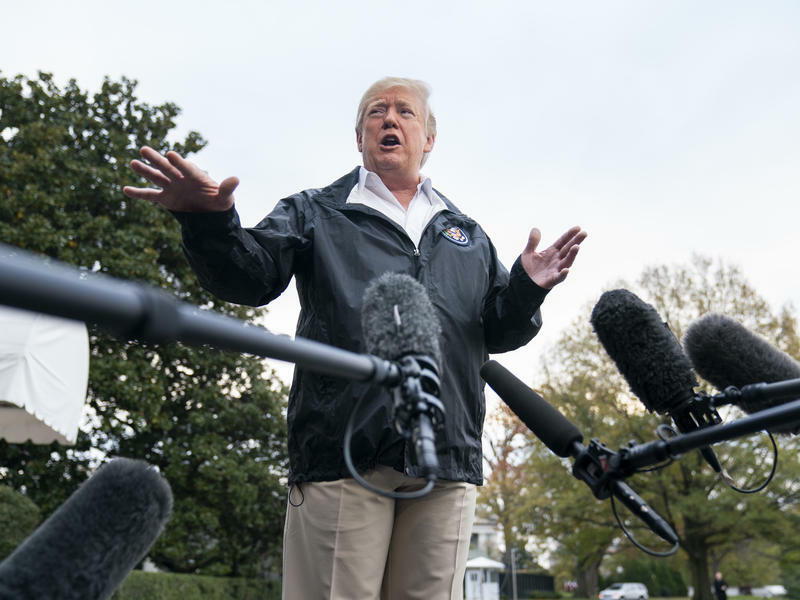 Despite frenetically campaigning, rallying and tweeting support for Republican candidates in the lead-up to the midterms, President Trump didn't take any responsibility for the GOP's losses in those elections in an interview with Fox News' Chris Wallace that aired Sunday. "I have people that won't vote unless I'm on the ballot, OK?" Trump said, later noting, "My name wasn't on the ballot."